One of the advantages of working with Lindus Construction is that we’re a full service contractor. Whether it’s decking, insulation, roofing, gutters, siding, windows, or remodeling, we’ve got the industry’s leading installers that collectively have decades of experience. When Kathleen and Steve requested an estimate from our company, their primary focus was on having covered gutters on their home. Their open style system was undersized, clogged and beginning to pull away from their home. A secondary concern of the couple was whether roof replacement was needed. Upon inspection, we noticed several signs that it had reached the end of its lifespan. They included missing granules, shingles that were pulling up, and algae growth. Here are the solutions we propose to get Kathleen and Steve’s roof up to snuff. The home’s gutters were undersized and pulling away from the structure. Roofing: The granules found on asphalt shingles act as a barrier against sunlight and precipitation. In addition, the color variations of the granules are a major contributor to the roof’s overall curb appeal. In Kathleen and Steve’s case, they needed a shingle with a color scheme that would tie in with the home’s brickwork, blue siding, and white windows. Pewter Gray Timberline Ultra HD® shingles proved to be the perfect match. The ultra-dimensional shingles create an enhanced shadow effect, which enhanced the home’s curb appeal. The couple appreciated that the shingles are manufactured with a proprietary technology called StainGuard Plus™. This technology is built specifically for the sole purpose of staving off algae growth, which can lower the lifespan of a shingle. Given the fact that algae had manifested itself on their previous roof, the couple appreciated the peace of mind Timberline Ultra HD® shingles would provide. In order to avoid future issues with roof shingles pulling up, GAF’s specialized starter strip shingles were used. They’re custom designed with a properly placed adhesive that is manufactured to inhibit shingle blow-off, even in extreme weather scenarios. 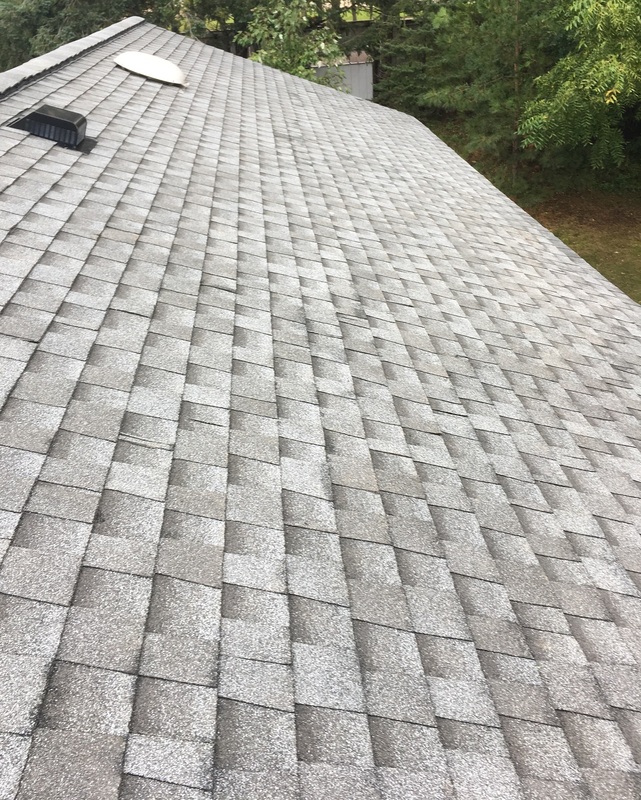 Here’s a close-up of how the Timberline Ultra HD® shingles looked after installation. Gutters: Stately trees adorned the couple’s yard, making maintenance on their open style gutters too frequent of a task. The weight of the debris inside the gutters was causing them to pull away from the house in some areas. Even more troubling was the meager size of the gutters and downspouts. Even perfectly clean, their ability to collect rainwater gushing off the home’s hip roof was questionable. Those issues aside, there were areas without gutters which was causing massive amounts of rain to come in contact with the home’s landscaping and at times, making it look unkempt. Left unaddressed, foundation damage or a wet basement were highly likely situations. Kathleen & Steven were ecstatic that LeafGuard® Brand Gutters were the solution to the issues their preexisting gutters had created. The issue of clogging was alleviated because the patented system is accompanied with a no-clog transferrable guarantee. This means that in the event the gutters ever required interior maintenance, our team would address the issue free of charge. The Good Housekeeping Institute not only awarded them their prestigious Seal of Approval but also certified them to handle over 32 inches of rain in an hour. The gutters are also accompanied with a Lifetime Workmanship Guarantee. In the event they pulled away from the home due to an installation issue, the fix would be performed by our installers at no cost to the couple. LeafGuard® Brand Gutters come with a “no clog” guarantee. While a charming aspect of the home’s curb appeal, the home’s mansard roof and insulation was creating a series of issues. Learn about the long-term solutions we were able to provide. 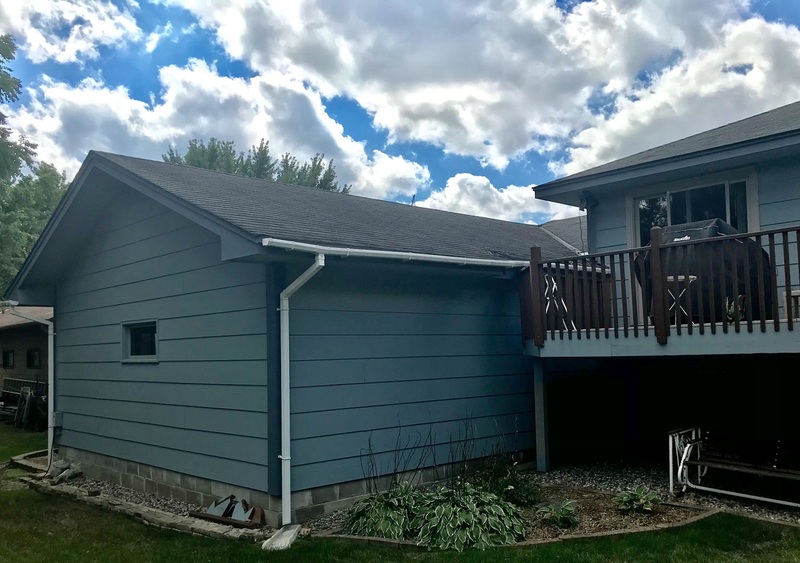 Learn why GAF Glenwood Lifetime Designer Shingles were the perfect material to replace this Twin Cities' home's cedar shake roof with. Here's the story behind the restoration work we completed that included new gutters and roofing. 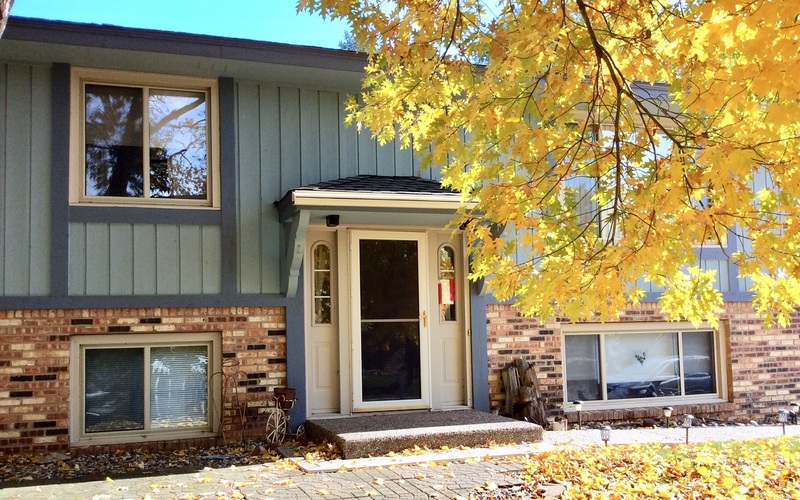 "Lindus replaced two portions of gutter with LeafGuard® gutters. Efficient, cleaned up and completed job in timely manner." "It was great! Jacob and James as a team were absolutely wonderful. We will request them for our next window installation. Very professional and friendly. Love the windows." - Mike B. “We were very pleased with the window replacement work done by Lindus Construction. The crew was professional, friendly and obviously took pride in their work. We would not hesitate to recommend them for anyone who is thinking of window replacement. - Nancy G.